This page describes the appearances of the god in the Trojan War including his wounding by Diomedes, grief at the death his son Askalaphos, battle with the goddess Athena and presence at the fall of the city. Like the rest of the gods, Ares was invited to the wedding of Peleus and Thetis. It was there that Eris cast the golden apple of discord amongst the goddesses, the first incident in a series of events which led to the Trojan War. "At the bidding of Zeus, Ganymede poured the wine [at the wedding of Peleus and Thetis]. And all the race of gods hasted to do honour to the white-armed bride [Thetis], own sister of Amphitrite: Zeus from Olympos and Poseidon from the sea . . . And iron Ares, even as, helmetless nor lifting warlike spear, he comes into the house of Hephaistos, in such wise without breastplate and without whetted sword danced smilingly [at the wedding]." At the outset of the Trojan War the gods seperated into pro-Greek and pro-Trojan factions. Ares, was indifferent, and at first promised his mother Hera and sister Athena that he would side with the Greeks in the War. However, Aphrodite convinced him to break his alliance and join her in support of the Trojans. "[Athena wounds Ares and accuses him :] ‘You are paying atonement to your mother's [Hera's] furies since she is angry and wishes you ill, because you abandoned the Akhaians, and have given your aid to the insolent Trojans.’ "
The Iliad of Homer begins with the mustering of the Trojan army, newly bolstered by troops sent by her allies in Anatolia in Thrake. The Greeks had returned to besiege Troy itself, after having laid waste to the countryside and the lesser towns of the Troad. As soon as the fighting commenced, the gods descended onto the battlefield in support of their favourites. Ares led the Trojans, but was wounded by Diomedes and Athena, and driven from the battlefield. "The cry of the Trojans went up through the wide army [as Troy and its allies engage the Greeks in the battle]. Since there was no speech nor language common to all of them but their talk was mixed, who were called there from many far places. Ares drove these on, and the Akhaians grey-eyed Athene, and Deimos (Terror) drove them, and Phobos (Fear), and Eris (Hate) whose wrath is relentless, she the sister and companion of murderous Ares." So she spoke, and led violent Ares out of the fighting and afterwards caused him to sit down by the sands of Skamandros while the Danaans [Greeks] bent the Trojans back." So he spoke, and himself alighted on the peak of Pergamos while stark Ares went down to stir the ranks of the Trojans, in the likeness of the lord of the Thrakians, swift-footed Akamas, and urged onward the god-supported children of Priamos : ‘O you children of Priamos, the king whom the gods love, how long will you allow the Akhaians to go on killing your people? Until they fight beside the strong-builded gates? A man lies fallen whom we honoured as we honour Hektor the brilliant, Aineias, who is son of great Ankhises. Come then, let us rescue our good companion from the carnage.’ So he spoke, and stirred the sprits and the strength in each man." "[The Trojans] drove the strength of their hands straight on, as violent Ares defending the Trojans mantled in dark night the battle and passed everywhere, since he was carrying out the commandments of Phoibos Apollon, him of the golden sword, who had bidden him wake the heart in the Trojans as he saw that Pallas Athene was gone now, she who stood to defend the Danaans." "Their [the Trojans'] fighting work which . . . the silver-bow god [Apollon] woke, and manslaughtering Ares, and Eris (Hate), whose wrath is relentless." "Hektor [the Trojan prince] . . . drove on against them [the Greeks] crying aloud, and with him followed the Trojan battalions in their strength; and Ares led them with the goddess Enyo, she carrying with her the turmoil of shameless hatred while Ares made play in his hands with spear gigantic and ranged now in front of Hektor and now behind him. Diomedes of the great war cry shivered as he saw him [for Athene had given him the ability to see gods] . . . and gave back, and spoke to his people : ‘Friends, although we know the wonder of glorious Hektor to be a fighter with the spear and a bold man of battle, yet there goes ever some god beside him, who beasts of destruction, and now, in the likeness of a man mortal, Ares goes with him. Come then, keeping your faces turned to the Trojans, give ground backward, nor be we eager to fight in strength with divinities.’"
[The two goddesses then departed for Troy to assist the Greeks] . . . So he spoke, nor did the goddess of the white arms, Hera, disobey, but lashed on the horses [descending to the battlefield of Troy] . . . So speaking she pushed Sthenelos [the charioteer of Diomedes] to the ground from the chariot, driving him back with her hand, and he leapt away from it lightly, and she herself, a goddess in anger, stepped in to the chariot beside brilliant Diomedes, and the oaken axle groaned aloud under the weight, carrying the dread goddess and a great man. Pallas Athene then took up the whip and the reins, steering first of all straight on against Ares the single foot horses. Ares was in the act of striping gigantic Periphas, shining son of Okheios, far the best of the men of Aitolia. Blood-stained Ares was in the act of stripping him. But Athene put on the helm of Death [Haides], that stark Ares might not discern her. So he spoke, and told Paieon to heal him; and scattering medicines to still pain upon him Paieon rendered him well again, since he was not made to be one of the mortals. As when the juice of a fig in white milk rapidly fixes that which was fluid before and curdles quickly for one who stirs it; in such speed as this he healed violent Ares; and Hebe washed him clean and put delicate clothing upon him. And rejoicing in the glory of his strength he sat down beside Kronion. Meanwhile, the two went back again to the house of great Zeus, Hera of Argos, with Athene who stands by her people, after they stopped the murderous work of manslaughtering Ares." Zeus had promised Thetis that he would give glory to the Trojans until her son Akhilleus had been mollified by the Greek leader Agamemnon. In accordance with this, he commanded the gods to withdraw from the battlefield. However in the fighting which ensued, Ares' son Askalaphos was slain. Ares would have rushed down to the battlefield to avenge him, but was restrained by Athena. "Deiphobos [of Troy] made a cast with the shining spear . . . and struck down with the spear the War God's son Askalaphos, so that the powerful spear was driven through his shoulder, and he dropping in the dust clawed the ground with his fingers. But Ares the huge and bellowing had yet heard nothing of how his son had fallen there in the strong encounter but he, sheltered under the golden clouds on utmost Olympos, was sitting, held fast by command of Zeus, where the rest of the immortal gods were sitting still, in restraint from the battle." So she spoke, and seated on a chair violent Ares." 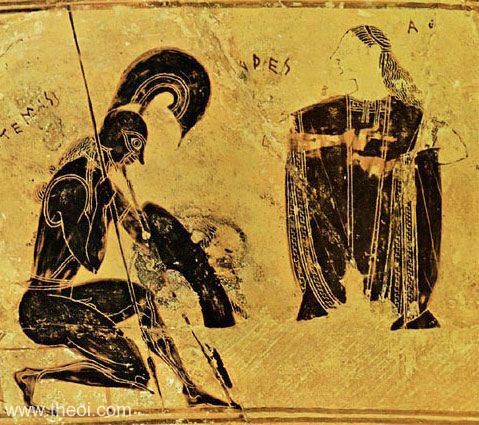 After the death of Patroklos, Akhilleus was agreed to reconcile himself with Agamemnon and rejoin the war. Zeus then allowed the gods to return to Troy. The divine factions immediately broke out into open conflict, in which Aphrodite and Ares were felled by Athena. So spoke the son of Kronos [Zeus] and woke the incessant battle, and the gods went down to enter the fighting . . . Ares of the shining helm went over to the Trojans, and with him Phoibos of the unshorn hair, and the lady of arrows Artemis, and smiling Aphrodite, Leto and [the river-god] Xanthos . . .
After the Olympians merged in the men's company strong Eris (Hatred), defender of peoples, burst out, and Athene bellowed . . . while on the other side Ares in the likeness of a dark stormcloud bellowed, now from the peak of the citadel urging the Trojans sharply on, now running beside the sweet banks of Simoeis. So the blessed gods stirring on the opponents drove them together, and broke out among themselves the weight of their quarrel . . . A crash sounded as the gods came driving together in wrath. For now over against Lord Poseidon Phoibos Apollon took his stand with his feathered arrows, and against Enyalios [Ares] the goddess grey-eyed Athene." "[Poseidon addresses Hera :] ‘Let us go away and sit down together off the path at a viewing place, and let the men take care of their fighting. Only if Ares begins to fight, or Phoibos Apollon, or if they hold Akhilleus back and will not let him fight, then at once they will have a quarrel with us on their hands in open battle. But soon, I think, when they have fought with us they will bet back to Olympos and the throng of the other gods beaten back by the overmastering strength of our hands.’ . . .
Poseidon and the other gods who were with him sat down and gathered a breakless wall of cloud to darken their shoulders; while they of the other side sat down on the brows of the sweet bluffs around you, lord Apollon, and Ares sacker of cities. So they on either side took their places, deliberating counsels, reluctant on both sides to open the sorrowful attack. But Zeus sitting on high above urged them on." After the death of Hektor, Prince of Troy, a new Trojan ally arrived to join the battle--the Amazon Penthesileia, daughter of Ares. To the god's great sorrow, she was swiftly slain by Akhilleus. After the death of Akhilleus, his son Neoptolemos took his place as the leading warrior of the Greeks, and routed the Trojans. Ares descended from heaven and drove the Trojans back into battle. They fled no more, they faced the Argive men . . . spurred by the chiding of their shepherd-lord; so turned the sons of Troy again to war, casting away their fear. Man leapt on man valiantly fighting; loud their armour clashed smitten with swords, with lances, and with darts. Spears plunged into men's flesh: dread Ares drank his fill of blood: struck down fell man on man, as Greek and Trojan fought. In level poise the battle-balance hung . . . the awful scales of battle hang level: all Trojan hearts beat high, and firm stood they in trust on aweless Ares' might, while the Greeks trusted in Akhilleus' son. Ever they slew and slew: stalked through the midst deadly Enyo, her shoulders and her hands blood-splashed, while fearful sweat streamed from her limbs. Revelling in equal fight, she aided none, lest Thetis' or the War-god's wrath be stirred. So man to man dealt death; and joyed the Fates and Doom, and fell Eris (Strife) in her maddened glee shouted aloud, and Ares terribly shouted in answer, and with courage thrilled the Trojans, and with panic fear the Greeks, and shook their reeling squadrons. But one man he scared not, even Akhilleus' son [Neoptolemos]; he abode, and fought undaunted, slaying foes on foes . . . stern Akhilleus' glorious scion joyed over the slain, and recked not of the God who spurred the Trojans on: man after man tasted his vengeance of their charging host. Even as a giant mountain-peak withstands on-rushing hurricane-blasts, so he abode unquailing. Ares at his eager mood grew wroth, and would have cast his veil of cloud away, and met him face to face in fight, but now Athena from Olympos swooped to forest-mantled Ida. Quaked the earth and Xanthos' murmuring streams; so mightily she shook them: terror-stricken were the souls of all the Nymphai, adread for Priam's town. From her immortal armour flashed around the hovering lightnings; fearful serpents breathed fire from her shield invincible; the crest of her great helmet swept the clouds. And now she was at point to close in sudden fight with Ares; but the mighty will of Zeus daunted them both, from high heaven thundering his terrors. Ares drew back from the war, for manifest to him was Zeus's wrath. To wintry Thrake he passed; his haughty heart reeked no more of the Trojans. In the plain of Troy no more stayed Pallas; she was gone to hallowed Athens. But the armies still strove in the deadly fray; and fainted now the Trojans' prowess; but all battle-fain the Argives pressed on these as they gave ground." In the final battles of Troy, Ares drove Aeneas to repel a Greek attack on the gates of Troy led by Neoptolemos. "Quailed the Akhaians, when Aeneas dashed to sudden fragments all that battle-wall moulded of adamant shields [the shield-wall of the Greeks advancing on the gates of Troy], because a God gave more than human strength. No man of them could lift his eyes unto him in that fight, because the arms that lapped his sinewy limbs fashed like the heaven-born lightnings. At his side stood, all his form divine in darkness cloaked, Ares the terrible, and winged the flight of what bare down to the Argives doom or dread . . . So crumbled down beneath Aeneas' bolts the Argive squadrons." The Greeks finally constructed the Wooden Horse as a ruse to capture the city. However the divine allies of Troy, perceiving hte plan, descended upon Troy to destroy it. Athena engaged Ares in battle and the pair fought until Zeus intervened, commanding all the gods to withdraw from Troy and let the city fall. "When imperious Zeus far from the Gods had gone to Okeanos's streams and Tethys' caves [and the Greeks were constructing the Wooden Horse], strife rose between the Immortals: heart with heart was set at variance. Riding on the blasts of winds, from heaven to earth they swooped: the air crashed round them. Lighting down by Xanthos' stream arrayed they stood against each other, these for the Akhaians, for the Trojans those; and all their souls were thrilled with lust of war: there gathered too the Lords of the wide Sea. These in their wrath were eager to destroy the Horse of Guile and all the ships, and those fair Ilion. But all-contriving Fate held them therefrom, and turned their hearts to strife against each other. Ares to the fray rose first, and on Athena rushed. Thereat fell each on other: clashed around their limbs the golden arms celestial as they charged. Round them the wide sea thundered, the dark earth quaked 'neath immortal feet. Rang from them all far-pealing battle-shouts; that awful cry rolled up to the broad-arching heaven, and down even to Hades' fathomless abyss: trembled the Titanes there in depths of gloom. Ida's long ridges sighed, sobbed clamorous streams of ever-flowing rivers, groaned ravines far-furrowed, Argive ships, and Priam's towers. Yet men feared not, for naught they knew of all that strife, by Heaven's decree. Then her high peaks the Gods' hands wrenched from Ida's crest, and hurled against each other: but like crumbling sands shivered they fell round those invincible limbs, shattered to small dust. But the mind of Zeus, at the utmost verge of earth, was ware of all: straight left he Okeanos's stream, and to wide heaven ascended, charioted upon the winds, the East, the North, the West-wind, and the South [in the shape of horses]: for Iris rainbow-plumed led 'neath the yoke of his eternal ear that stormy team, the car which Time the immortal framed for him of adamant with never-wearying hands. So came he to Olympos' giant ridge. His wrath shook all the firmament, as crashed from east to west his thunders; lightnings gleamed, as thick and fast his thunderbolts poured to earth, and flamed the limitless welkin. Terror fell upon the hearts of those Immortals: quaked the limbs of all - ay, deathless though they were! Dreading Zeus' menace gave they heed to her, from strife refrained, and cast away their wrath, and were made one in peace and amity. Some heavenward soared, some plunged into the sea, on earth stayed some."